Galangal. The rhizome of a plant of the ginger family, although it is smaller and more shrivelled. 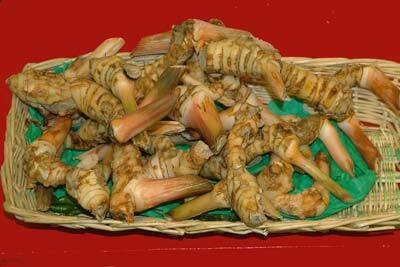 It has more translucent, flesh-coloured skin than the rhizome of ginger. It is peeled and grated or thinly sliced and used in the same way that fresh ginger is used, but has a slightly more complex flavour reminiscent of camphor. Greater galangal resembles a cross between ginger and pepper; lesser galangal is more pungent, with cardamom and eucalyptus flavours, whilst kempferia is the strongest.